French 75: gin, lemon, Lillet rose, sugar, peach bitters, prosecco. It was my first time at Corner Door, which just opened in June next to A-Frame and Waterloo & City in Culver City, and yet the bartender made me a French 75. I looked at him sideways, sorta disappointed that he decided to lead with that at this hosted tasting. Why not show off with something original from the specialty cocktail section of the menu? But he assured me that this French 75 was a little different. Sure enough, instead of the ho-hum champagne cocktail I expected, it came across as a gin cocktail. Nice! The dryness of the prosecco came through but the bubbles were diluted with gin and Lillet Rose. Not a bad thing. The peach bitters finished things off in a subtle summery way. Well, this was promising. Of course, I figured I couldn’t go wrong with the cocktails at Corner Door seeing as how Beau Du Bois, the bar’s mixmaster, had done some impressive stuff for MB Post in Manhattan Beach when he was there. And here, he had effectively added to my dream Westside cocktail bar hop route connecting Culver City to Venice, from Oldfield’s to A-Frame to Sunny Spot and Tasting Kitchen. Yayy! Corner Door’s cocktail menu is divided into two categories of Classics with Palomas and Old Fashioneds and “Originals.” But the originals are classically inspired with a short list of simple ingredients and a dash of edginess thrown in. For the current menu, which is their opening menu, there are turns on the Monkey Gland and Penicillin which will leave you pleasantly surprised, seeing the direction Beau took those cocktails in. By the way, you gotta love the names he comes up for these. A new fall menu is planned for September so you have til then to try these out for yourself. Here are the Originals cocktails along with some tasting notes. 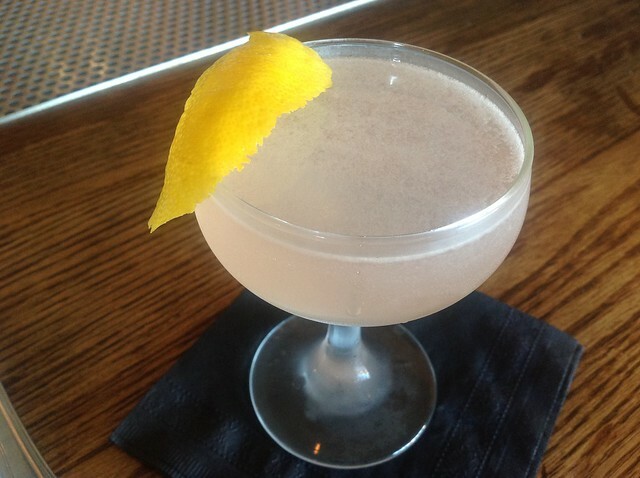 Mezcallin: mezcal, ginger, lemon, pineapple gomme. 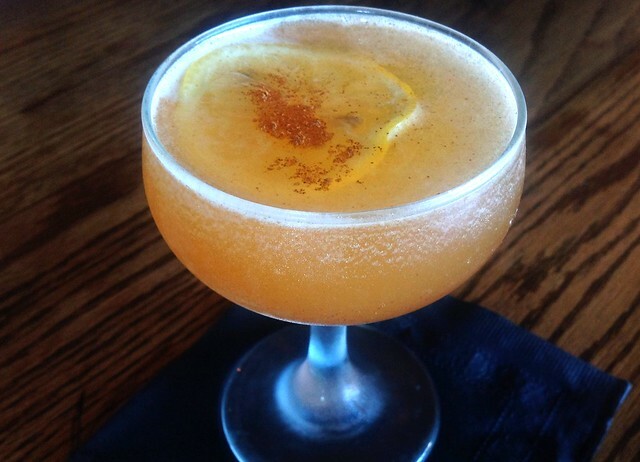 Miner Incident: bourbon, apricot, lemon, honey, Thai chili. Miner Incident: You gotta be careful with this spicy take on a Gold Rush as it can easily get out of hand so ask the bartender to take it easy on the chili unless you want to taste nothing but heat. 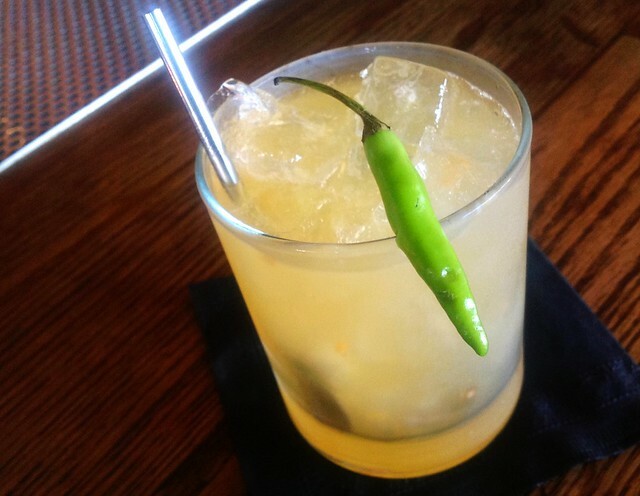 For me the spice overwhelms the flavors in the cocktail. Where’s the apricot, lemon and honey? Oh, I can’t taste anything other than the burning burning burning. When they redid the cocktail, though, with less spice, the pepper still comes through but only on the back end and the bourbon pops up midpalate. I thought it was just OK but apparently it’s one of the more popular cocktails off the list. Fortune & Glory: gin, orange, cantaloupe, absinthe, orgeat. 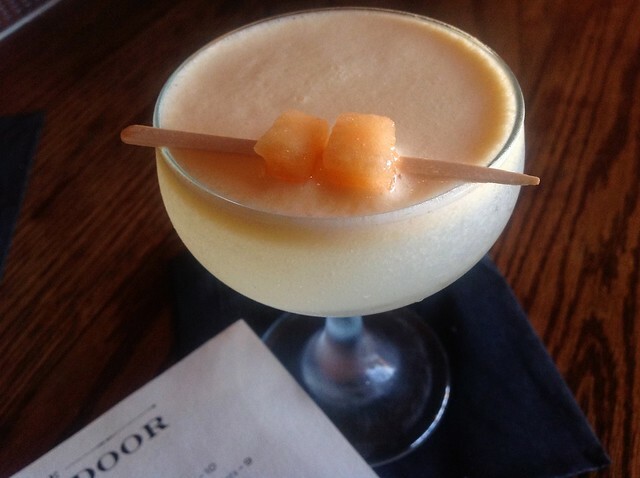 Fortune & Glory: Mellow warm flavors of cantaloupe and orgeat. Almost like a melony orange and cream soda, if that makes sense. Inspired by the 1920’s classic Monkey Gland cocktail, Beau decided to substitute orgeat for the grenadine, which usually tends to be heavy and create an unsavory brown color when mixed with the orange juice in the original cocktail. Nice way to start off the evening or end a meal. Dutch Prison: arrack, curaçao, lemon cordial, peach, black tea, cinnamon. Dutch Prison: Multi-layered and complex. You can taste the lemon, peach and cinnamon up front all complementing that black tea. Oddly enough though, it reminds me of an apple cider. Heads-up: For the happy hour, which is Monday through Thursday 5:30-7pm, fortify your stomach for the night of drinking ahead with the grilled cheese sandwich. Surprisingly more substantial than you’d expect of an HH dish and oh-so delicious with its thick bread and apricot jam! I’m with you there. Wouldn’t mind a little fortune and glory myself, either of them, right about now. Cool to see Beau running a bar program in Culver. I met him at Andaz and enjoyed his cocktails at what was initially an ambitious restaurant and bar. Food GPS, Did you visit Beau when he was at MB Post? Loved his cocktails there, too. That’s pretty funny… I’ve never sent back a cocktail in my life, but had to have my Miner Incident remade. SO HOT! It made me wonder if he rubs the rim of the glass with the cut chili. Zach, Riiight? I’m surprised when they straw test it that they still send it out.